Lyme disease is a bacterial infection. The infection is spread from the bite of an infected deer tick. Lyme disease is caused by bacteria found in some deer ticks. An infected tick passes Lyme disease to humans through its bite. If untreated, the bacteria can pass into the blood. The blood will carry it through the body. The bacteria may then settle in various body tissues. The symptoms of Lyme disease will be different in each person. They can also range from mild to severe. The first sign may be a red rash. The rash starts as a small red spot at the site of the tick bite. It will then spread over the next few days or weeks to form a circular or oval-shaped rash. 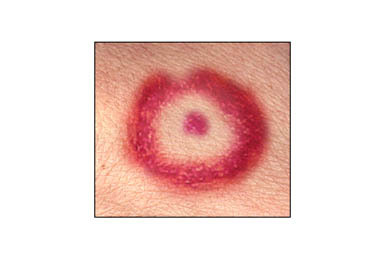 Sometimes, the rash resembles a bull's eye with a red ring around a clear area with a red center. The rash may cover a small dime-sized area or a wide area of the body. This is an example of a Lyme disease rash shaped like a bull's eye. It may not always be this shape, nor will a rash always appear. These symptoms do not necessarily mean you have Lyme disease, even if you have spent time outdoors. See your doctor right away if you have these symptoms and think you have been exposed to a tick. Lyme disease may be diagnosed based on your symptoms and the history of a tick bite. After 4 weeks of Lyme disease, your body may create antibodies against the infection. A blood test may help look for these antibodies. The blood test cannot confirm or rule out Lyme disease. Instead, the results of the blood test will be used in combination with your symptoms and personal history to make a diagnosis. Lyme disease responds well to antibiotics. These medications can kill bacteria. The length of your antibiotic treatment will depend on your condition. You may need to take them for 10 days to 3 weeks or more. You may be given the antibiotics by mouth or through an IV. Wear a long sleeve shirt. Tuck it into your pants. Do a full-body check for ticks at the end of a day spent outdoors. Consider bathing or showering within 2 hours of coming indoors. Check your child for ticks. Make sure to check for hidden areas like the hair, around the ears, or behind the knees. Check pets and gear for ticks. Put clothes worn outdoors in the dryer for 20 minutes. This will kill any unseen ticks. Use a pair of tweezers to grasp the tick by the head, as close to the skin as possible. Pull directly outward. Use gentle but firm force. Do not twist the tick out. Try not to crush the tick's body or handle it with bare fingers. This can spread the infection. Wipe the site with an antiseptic to prevent infection. There are some steps that do not help. They may cause more problems. Do not put a hot match to the tick. Do not cover the tick with petroleum jelly, nail polish, or any other substances. If you have been bitten by a deer tick, especially if you live in an area where Lyme disease is common, you should watch for a rash to appear. A rash can occur in about 70-80% of infected persons and generally begins at the tick bite site. The rash may appear within 3-30 days, usually before the onset of fever. The rash is usually the first sign of infection, is usually circular, and is called erythema migrans (EM). Some may develop additional EM lesions on other parts of the body. If you have a tick bite and live in a high-risk area, your doctor may recommend a dose of antibiotic. This may reduce the risk of contracting Lyme disease if taken within 72 hours after a tick bite. However, this antibiotic can have serious side effects in children younger than 8 years old. This prevention step is only used in people older than 8 years of age. The risk of getting Lyme disease after a single tick bite is low. Many experts do not recommend preventive antibiotic treatment. Lyme disease. Centers for Disease Control and Prevention website. Available at: https://www.cdc.gov/lyme. Updated January 19, 2018. Accessed February 15, 2018. Lyme disease. EBSCO DynaMed Plus website. Available at: http://www.dynamed.com/topics/dmp~AN~T114365/Lyme-disease . Updated September 22, 2017. Accessed February 15, 2018. Lyme disease. Family Doctor—American Academy of Physicians website. Available at: https://familydoctor.org/condition/lyme-disease. Updated June 2017. Accessed February 15, 2018. Lyme disease. National Institute of Allergy and Infectious Diseases website. Available at: https://www.niaid.nih.gov/diseases-conditions/lyme-disease. Updated April 6, 2016. Accessed February 15, 2018. Nadelman RB, Nowakowski J, Fish D, et al. Prophylaxis with single dose doxycycline for the prevention of Lyme disease after an Ixodes Scapularis tick bite. N Engl J Med. 2001;345(2):79-84. 1/4/2011 DynaMed Plus Systematic Literature Surveillance http://www.dynamed.com/topics/dmp~AN~T114365/Lyme-disease : Warshafsky S, Lee DH, Francois LK, Nowakowski J, Nadelman RB, Wormser GP. Efficacy of antibiotic prophylaxis for the prevention of Lyme disease: an updated systematic review and meta-analysis. J Antimicrob Chemother. 2010;65(6):1137-1144.